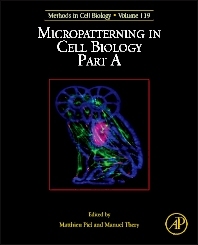 This new volume of Methods in Cell Biology looks at micropatterning in cell biology and includes chapters on protein photo-patterning on PEG with benzophenone, laser-directed cell printing and dip pen nanolithography. The cutting-edge material in this comprehensive collection is intended to guide researchers for years to come. Matthieu Piel and his team develop microfabricated and microfluidic tools to quantitatively control the physical parameters of the cell’s environment and study how cells grow, divide and migrate. The team focused on how physical confinement, geometry and forces affect cell division and cell migration. The general aim of these studies is to draw a line between the physics of the active matter cells are made of and the behavior of cells in the complex environment of tissues, in the context of the immune response and tumor development.